Rhinological interventions for sleep apnoea, patulous Eustachian tube and the demise of the tuning fork? Edward Fisher, Musheer Hussain, Jonathan Fishman,	The Journal of Laryngology & Otology, Volume 133 Issue 3, p 167. S Sharma, J C R Wormald, J M Fishman, P Andrews, B T Kotecha,	The Journal of Laryngology & Otology, Volume 133 Issue 3, pp 168-176. C Dawson, P Pracy, J Patterson, V Paleri,	The Journal of Laryngology & Otology, Volume 133 Issue 3, pp 177-182. M A Hamed, R H Sayed, K Shiogama, M A Eltaher, K Suzuki, S Nakata,	The Journal of Laryngology & Otology, Volume 133 Issue 3, pp 183-186. P Mukherjee, K Cheng, I Curthoys,	The Journal of Laryngology & Otology, Volume 133 Issue 3, pp 187-191. A Gupta, K Sikka, D V K Irugu, H Verma, A S Bhalla, A Thakar,	The Journal of Laryngology & Otology, Volume 133 Issue 3, pp 192-200. A Alli, R Shukla, J-L Cook, A Waddell,	The Journal of Laryngology & Otology, Volume 133 Issue 3, pp 201-204. J Prueter, D Norvell, D Backous,	The Journal of Laryngology & Otology, Volume 133 Issue 3, pp 205-207. R Haye, M T Egeland, L K Døsen, C Gay, M TarAngen, O Shiryaeva,	The Journal of Laryngology & Otology, Volume 133 Issue 3, pp 208-212. Y Tu, H Zhang, L Zhao, P Jin, X Zi, T Li, L Shi, L Zhi,	The Journal of Laryngology & Otology, Volume 133 Issue 3, pp 213-219. 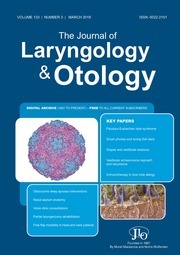 S Üstün Bezgin, T Çakabay, K Irak, M Koçyiğit, B Serin Keskineğe, S Giran Örtekin,	The Journal of Laryngology & Otology, Volume 133 Issue 3, pp 220-223. S Goh, D Karamchandani, S Anari,	The Journal of Laryngology & Otology, Volume 133 Issue 3, pp 224-226. M Suzuki, Y Nakaegawa, T Kobayashi, T Kawase, T Matsuzuka, S Murono,	The Journal of Laryngology & Otology, Volume 133 Issue 3, pp 227-229. A Minkara, M R Simmons, A Goodale, Y J Patil,	The Journal of Laryngology & Otology, Volume 133 Issue 3, pp 230-235. T Tikka, S Corson, K Kavanagh, A Lowit, K MacKenzie,	The Journal of Laryngology & Otology, Volume 133 Issue 3, pp 236-240. J Kovarik, M Bhabra, A W Tin, G Shaikh, M S Iqbal,	The Journal of Laryngology & Otology, Volume 133 Issue 3, pp 241-244. Can smartphone vibration provide a valid alternative to tuning forks for use on the ENT ward round? M E Hopkins, D Owens,	The Journal of Laryngology & Otology, Volume 133 Issue 3, pp 245-247. S Nishiike, K Oshima, T Imai, S Uetsuka,	The Journal of Laryngology & Otology, Volume 133 Issue 3, pp 248-250. J P K Ho, E Wong, D A Gunaratne, N Singh,	The Journal of Laryngology & Otology, Volume 133 Issue 3, pp 251-255. S Khosla, N Caton, T-T Zhang, C R Davies-Husband,	The Journal of Laryngology & Otology, Volume 133 Issue 3, pp 256-259. Elfy B Chevretton, Irumee Pai, Sherif Haikel, Ann Sandison, Steve Connor, Ata Siddiqui,	The Journal of Laryngology & Otology, Volume 133 Issue 3, pp -.